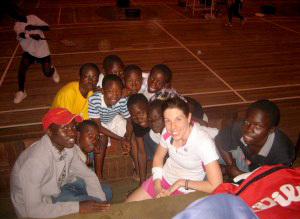 While competing for Team USA from 2005-2008, Shannon was moved by the extreme poverty and lack of athletic resources available to children in Africa, despite their keen interest in badminton. Players from Berundi had to borrow rackets and share them just to compete internationally for their country. Many more children wanted the opportunity to play but lacked the resources. 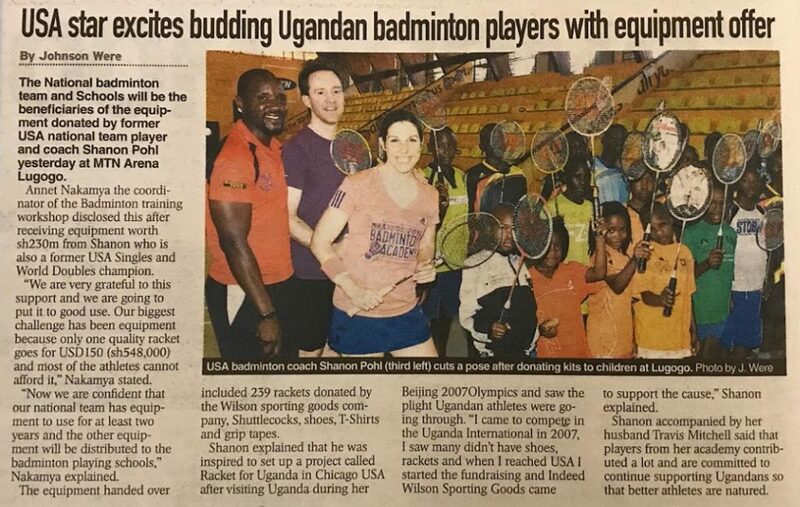 Shannon brought bags of badminton equipment and clothes to tournaments that she collected from international players in Denmark for the children in the stands who were from the slums of Nairobi, Kenya and Kampala, Uganda. 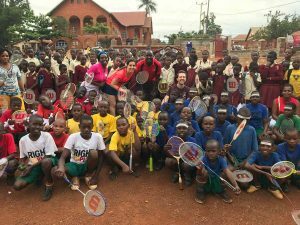 In 2012 she developed the “Rackets for Uganda” program at the SPBA for which clubs and players from throughout the Midwest donate old equipment. She also recruited the help of Wilson Sporting Goods and collected more than 239 rackets, shuttles, shoes, grip tapes, strings, and t-shirts. The SPBA Elite Bronze Squad also took a special interest in this project in 2017. 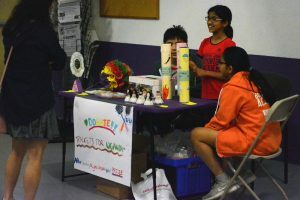 The players ages 8-11 met up over several weekends and crafted a variety of fun items such as dolls, picture frames, dart boards, rainsticks and more out of used badminton equipment. They wanted to help the kids in Africa while at the same time recycling used badminton products. They then gave out these prizes to sponsors of the Rackets for Uganda Project at the SPBA Midwest Super Regional Tournament and raised several hundred dollars and created a lot of awareness to our project! They did a great job! Shannon worked together with the support of friends from the Uganda National Team and ran a 2 day clinic in Kampala, Uganda on her honeymoon on October 18th and 19th, 2017 for these underserved kids. 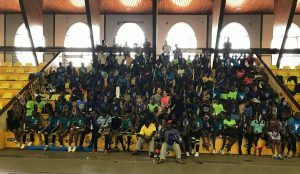 There was over 150 participants of all ages and levels who took part in the clinic from beginners to National Team players. Shannon and several local volunteer coaches and sports organizers worked long hours each day teaching the fundamentals of badminton, with a big emphasis on technique and footwork. 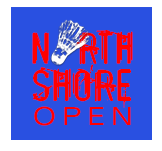 Each player got to pick out their own racket and got a badminton t-shirt. Most of these players had never owned their own racket before, and for the top players they got a much needed upgrade to old equipment. Some players who lacked shoes got a pair of sneakers. 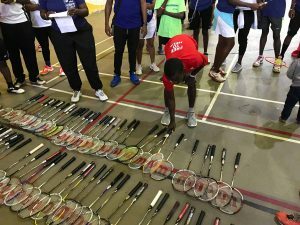 6 schools who run badminton programs throughout the year also were gifted rackets and shuttles for ongoing use. Shannon provided bottled water for all the kids for both days and also a nice lunch on the last day for all participants and volunteer coaches. Shannon and her husband Travis, also teamed up with the organization, Right to Play. This is a wonderful organization that works in many developing countries to help educate children through the joys of sport and play. Shannon and Travis visited one of the Kampala Right to Play schools, where they were able to learn more about the program, the children, and the issues they face by playing various games with the children. 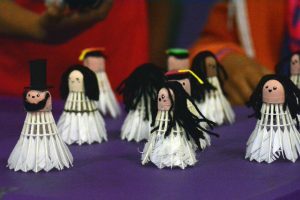 One of the games was called “Mosquito Tag.” In this game, children were educated about the ways to avoid and treat Malaria. The kids were separated into groups–Mosquitoes, Nets, Doctors, and People. The mosquitoes would try to tag the people and the people could run to a safe place under one of the nets where they couldn’t be tagged. If a person was tagged, they would have to freeze and show one of the 3 signs of Malaria which would cause one of the doctors to run over and pretend to administer a shot. Then the player could keep playing. It was a very eye opening experience. After learning some of the Right to Play games, Shannon and Travis brought out the rackets and shuttles and taught the children some basic skills. The kids had mostly never seen badminton before and had a lot of fun. Many rackets and shuttles were then donated to the school for future fun. Thank you so much for all the sponsors, donations, organizers, and volunteers for making this such an incredible project to be a part of! Annet, Kabindi, Tukire, and Edwin, thank you so much for all your hard work and support to make this happen! 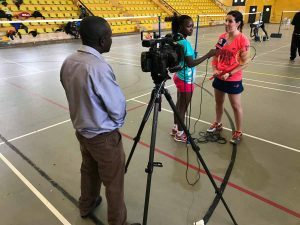 Also thank you to the local newspaper, and both the National and East African TV for helping spread the word about the great sport of badminton throughout Africa! Full photo gallery can be seen here! 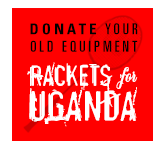 Would you like to make a donation to the “Rackets for Uganda” Program? Make a secure donation right now using Paypal.